Summary: This challenging walk is the distance of a marathon but it would be a travesty to run it like an athlete; much better to stroll and take in all the beauty on offer. Adam Gallimore undertook the walk in November 2011 and thoroughly enjoyed his experience as is reflected in his report below. In all he walked through six Peak District dales. 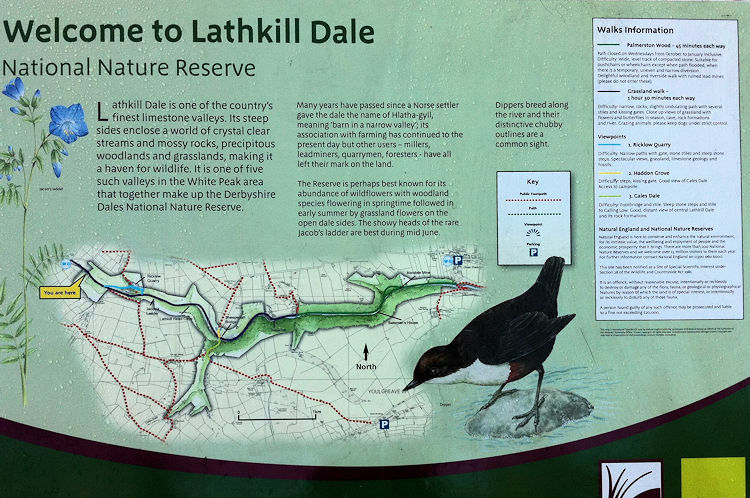 In order they were Biggin Dale, Wolfscote Dale, Beresford Dale, Lathkill Dale, Bradford Dale and Long Dale. The Walk: Beep, beep, beep, beep, beep sounded the alarm clock at 4.30am on a dark Autumn morning. 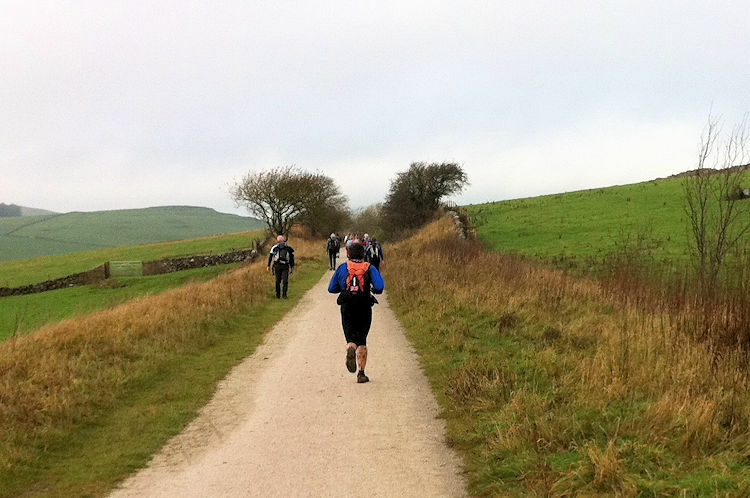 Well here it was at last; Saturday November 11th 2011 the day we had been looking forward to since registering for the 6 Dale challenge. Luckily I had organised my kit, rucksack and food the previous evening, so after a quick swill to wash the sleep from my eyes and a stern warning to Freyja and Kyra my cats not to wreck the house in my absence I loaded up the car and set off to pick Dave up from his house on the other side of town. Arriving at Connor Mansions, Dave was waiting by the front door equipment ready, itching to go. 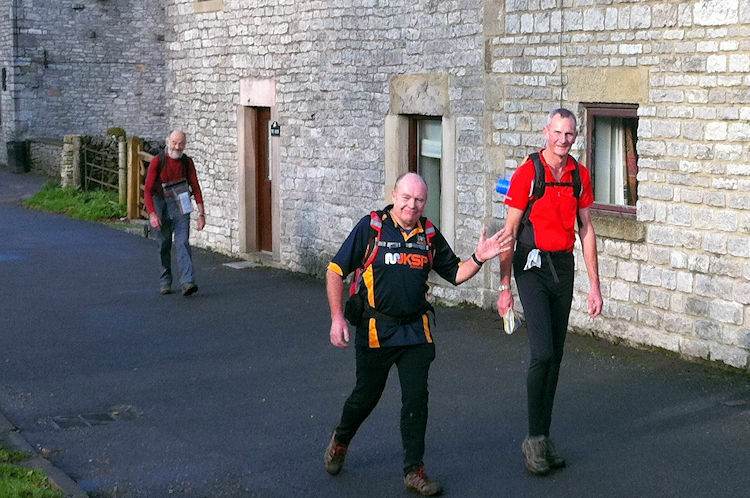 Two minutes later we were on our way; destination Biggin Village Hall some 53 miles away in the beautiful Peak District. Thanks to our Navigator Homer Simpson we rolled in to Biggin with plenty of time to spare despite numerous route changes due to road closures. The time was 6.30am as we parked up on the field at the side of the Village Hall and already the official parking area was beginning to fill up. Quickly we grabbed our rucksacks from the boot and headed into the hall as it was still rather chilly and besides that I wanted some porridge before setting off. Surprisingly registration was open so we confirmed our names and numbers, picked up our tally cards and said thank you to Janet one of the organisers for collecting our walking fees from the post office as we had not paid enough postage. As we did our final kit check and put on our warm gear the Village Hall filled up with more walkers and runners. Some were old friends from previous challenge events and we were all keen to get started. Soon enough it was 8.00am and time for the challenge to commence. Left out of the Village Hall and down Drury Lane two hundred plus loons embarked on the 25 mile challenge all hoping to get to the finish without major feet issues. The two Geoffrey's (my trusty Salomon Quests) would be my walking companions once again and they hate blisters as much as I do. At the 'T' Junction (Liffs Road) we turned left and headed towards the Bridal Way 230 yards on where we turned right and descended to the junction of the dales, forking left on to Biggin Dale (sign posted Wolfscote Dale Grid Ref SK145588). Even though we were less than a mile in to the walk the field was already thinning out and we were well in front of the mid pack congestion. Ahead we walked for 1.25 miles along the grassy, sometimes stony trail to meet the River Dove (Grid Ref SK142569). Turning right into Wolfscote Dale we followed the riverside footpath for approximately 1 mile taking in the scenery as we walked. One thing I like about walking with Dave is that he knows his birds and true to form today was no exception as he pointed out Herons and Dippers. To be honest I thought that the Heron which flew over us was a seagull so it was nice to be educated as to the different species we saw along the river bank. Ahead of us another walker of the four legged variety was having fun of his own, splashing about in the river. Can't say that I blame him as by now the temperature was beginning to warm up and layers were starting to come off as well as my woolly hat. No bacon butties at this check point, just cordial and biscuits. Not to worry though as we were only 5 miles in to the walk and not really hungry. However, with 7 miles to the next check point I thought I'd best water my horse. Imagine my surprise at what happened next. I am going about my business and glance round like you do, well its only blooming Tony Robinson stood at the side of me. "Hello Tony" I said with a beaming smile on my face. "My daughter thinks I look like him as well but I don't know weather to take that as a compliment or what?" he replied. "Oh a compliment for sure; not many people can boast having had a wee with Baldrick." I laughingly replied. When he declined my request of a photograph I was a little disappointed, but on reflection perhaps it was for the best as the gent's lavatories is not the best place for this. Relieved and hydrated we set off for Monyash (Check Point 2). Turning right into Hartington and bearing right around the Village Square, we then turned left immediately before the church onto Hide Lane. Quite a narrow lane and within seconds two cars were having a bit of a stand off neither wanting to yield to the other and of course holding up the walk. In the end Mr 4X4 won the duel and we were able to continue on our way once more. As we walked up the lane we chatted to another walker, Dave, a late 60 year old with a canny resemblance of Captain Birdseye. Despite his age he was as fit as a racing snake and would later leave us in his dust. After 0.5 miles, immediately after a farm we turned left over a stile and on to a footpath (Grid Ref SK130612). Ahead over stiles, through metal gates and wicket gates we trudged through the sometimes muddy fields for 1.25 miles, eventually reaching a small group of trees next to a gate (Grid Ref SK125630) Through the gate we carried on following the a way marker slightly uphill to the corner of a wall before descending to reach the valley bottom (Grid Ref SK124634). Turning right over yet another stile (sign posted Parsley Hay) we headed towards a barn and then bearing left followed marker posts over the side of the hill and down to Hide Lane (Grid Ref SK137632). Crossing the road we followed the track through Vincent House Farm and with the wall on our left we continued over 3 more stiles, through a gateway and a wicket gate before reaching Darley Farm. 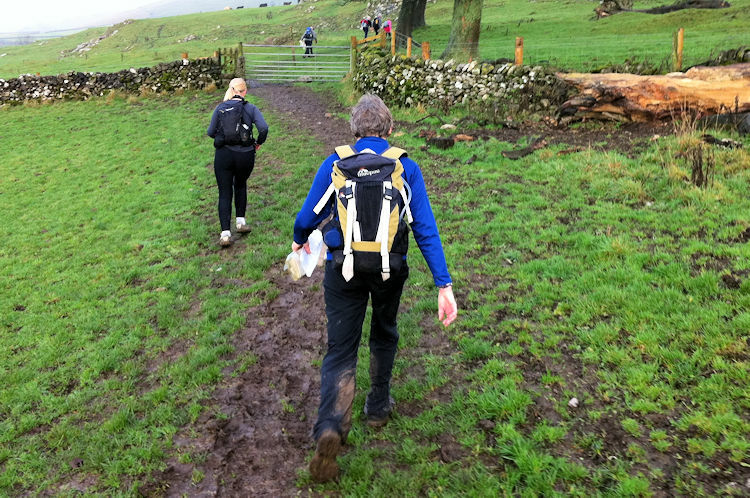 As we walked through the farm, keeping left of the 2 gates, towards the High Peak Trail the first of the runners were now coming through wearing there mud caked salomon and INOV8 trail running trainers. As we greeted the runners who passed us I couldn't help but think that they were not wired up right. I mean fell running? What's all that about? It's just not normal if you ask me. Dave and I admit to finding it hard keeping our footing at the best of times in the slippery mud or rocky paths with out adding running into the pot. Having said that they looked happy enough and I suppose that's the main thing. Turning left on to the High Peak Trail we now had a straight 2 miles of decent foot path to walk along and as we did more runners passed us. Being a nice day with no cloud we could easily make out landmarks and asses how far along the route we where even though there was not much to see really on this stretch of the trail. After 2 miles we passed the car park / picnic area where we would leave the trail and 200 yards after walking under a bridge we took the footpath on the right slopping down off the trail to a gate. Following a way marker through a gap in the wall to a stile and then ahead over a further 2 stiles to meet The Bull I'th Thorn on the A515. We carefully crossed the road, turning left on to the Hutmoor Butts Track and continued to the junction a mile further along. I don't mind admitting that the thought of a few pints crossed my mind but they would have to wait. Well for the time being anyway. At the junction we turned right on to Cross Lane passing a farm to our left and then taking a stile in the wall on the left just where the track turned right. We continued ahead along the footpath over 8 more stiles to reach the corner of some houses as we approached Monyash. Following the footpath down the side of the houses we noticed a few building projects on the go. Dave commented that it would be quite cheap to build a cottage around here as you could pinch the stone you needed from the dry stone walls. Hmmmm, don't think the farmers would be too happy with that somehow. Crossing a track to an enclosed path we emerged on to Chapel Street, we were now almost half way through the walk. Turning right and then left at the crossroads on to Church Street, Monyash Village Hall (Checkpoint 2) was only 300 yards further on. It was 11.20am as we entered the hall and guess what? Yep, Dave the racing snake had caught us up. I grabbed myself a mug of tea and ate my sandwiches. Even though there was food laid on I though it wise to eat what I had brought. Roast beef, pastrami and horseradish sandwiches, pfwhooor, they were fantastic even if I do say so my self. Dave tried some of the free food and commented that the oatcakes filled with cheese where great. We spent around 15 minutes at the check point and then it was time to get on our way. Turning right on Shutts Lane we headed over the bridge towards a footpath 150 yards away on the left. Continuing for 0.5 miles across fields and over stiles by the side of the river we had now reached Alport Lane in Alport. We crossed the road past a farm in the direction of a white gate. In the field there where black sheep and chickens. Some of the chickens where sat on the fence and they even had there own stiles for accessing the field. As we walked along the track towards Mawstone Lane both my self and Dave where beginning to feel the burn in the tops off our thighs and I was sure that a nice little blister was making its presence known on my inner heel. As we were further on than we expected we decided to slow our pace down a little and it was not long before we were passed by a couple of other challengers namely Tony Robinson look a like with his wife and daughter. Crossing Mawstone Lane we continued along Bradford Dale for a short distance via the path to the right of the river before crossing a footbridge to other river bank. 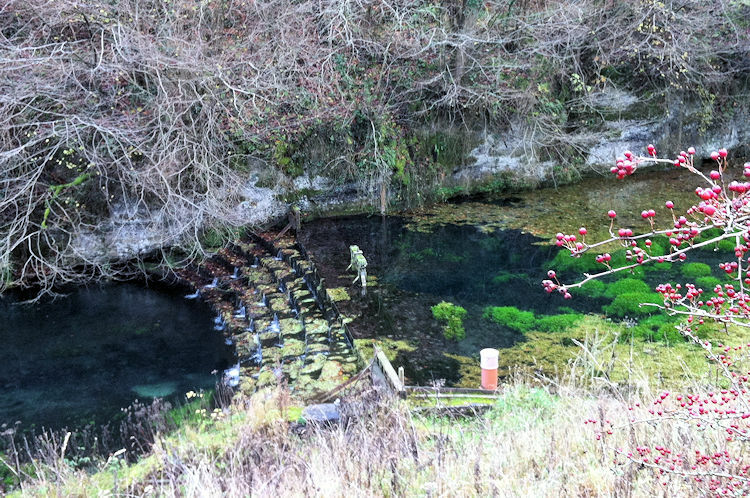 For 0.75 miles we continued upstream before reaching a 'Y' Junction. Keeping to the main track as it swung right we followed the track uphill for 400 yards to emerge at a road junction opposite an enclosed play area (Grid reference SK197632). Turning right along Weaddow Lane (signposted Youlgreave/Bakewell) we walked a further 200 yards to Middleton Village Hall on left (Check point 3). As we entered the Village hall there were already a few walkers milling around having a quick brew before heading off again. Fruit cake and flapjacks, mmmmmmmm, just what the doctor ordered I thought as I ate a few with my mug of tea. Well it would be rude not to, wouldn't it. Dave noticing the flapjacks joined in too. Looking at my watch I gestured to Dave and we set off on the home stretch. Leaving the Village Hall we retraced our route to the 'Y' junction at the river. Turning right on the footpath at the junction we crossed a footbridge and then climbed up some metal steps. Being an architectural draughtsman I was impressed with the stair design. One half of each tread was open grate and the other slip resistant plate. How very considerate I thought. However, did not expect to see many if any women wearing stilettos walking along the river bank. Turning right we descended to cross a stream using some large slabs. One of the slabs was engraved "Consult the genius of the place in all that tells the waters or to rise or fall ". Not only was I being educated by Dave in all maters ornithological but also now a bit of poetry. What a brilliant day, I thought to myself as we continued ahead through 2 gates and over 3 stiles to reach a farm track. Crossing the track and over the stile opposite heading towards a gap in the hedge with a stream on left we entered a wooded area leading to Weaddow Lane. Turning left we followed the road for 0.25 miles to where it turned sharp left. Leaving the road we continued along the track, through a gate to meet a wider track. Bearing right under telegraph wires, through a gate and along an enclosed track (keeping the wall on our left) to the gate at the top of the hill (Grid reference SK189605) we proceeded. Turning right through the gate we followed the crest of the hill. This was Long Dale, last of the six and after a short while we descended to a gate, then turning left down hill we walked along the edge of Larch Wood and on to Green Lane before reaching the road (Grid reference SK175612). Turning left on to the road, under a bridge and past DSF Refractories & Minerals Ltd we continued to a 'T' junction. Turning right on the A5012 we headed to the junction adjacent to the Carriages Pub and Restaurant a further 200 yards along. Turning left at the junction we joined the main road (A515) and after 150 yards we crossed the road (just past Old Newhaven Hotel) to the Stanedge Grange signpost. Crossing the cattle grid taking care not to break any ankles at this late stage we crossed the field diagonally to a stile in corner of the wall. Over the stile and across the field to a gate in the middle of the far right hand wall we went. Up and over the Tissington Trail we could see Biggin Village even though I must admit that by now our legs were so tiered we took the easy option of the path rather than risk falling down the steep embankment. A quick look at my watch, 3.45pm; I smiled because I knew in 5 minutes time we would be done. We headed for the last stile in the left corner of the field. Over the stile we went turning left down the alley to reach Main Street and then a quick right and then left to finish in Biggin Village Hall. 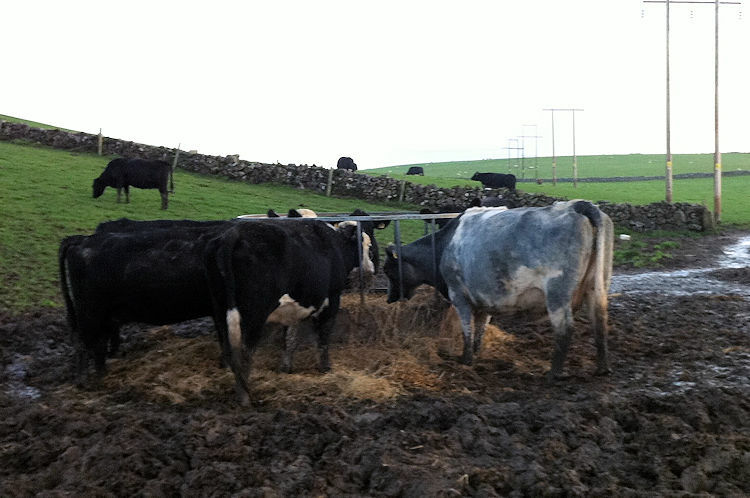 Wooooo hoooooo we had completed the 6 Dales Challenge in 7 hours 50 minutes now it was time for some food. Entering the Hall we were told that we had to remove our boots first. "Sorry Geoffrey and Jeffrey you will have to wait outside for a short time, but don't worry you can have a nice wash when we get home" I said to my trusty walking boots then went inside to hand over my final tally and receive my certificate. As we ate our well deserved meal we reflected on the day's adventure and both agreed that next year we will be quicker. I would just like to say a big thank you the Staffordshire LDWA for organising the walk and all the hard work that went into it. See you next year guys.